September 06, 2018 at 9:05 am. 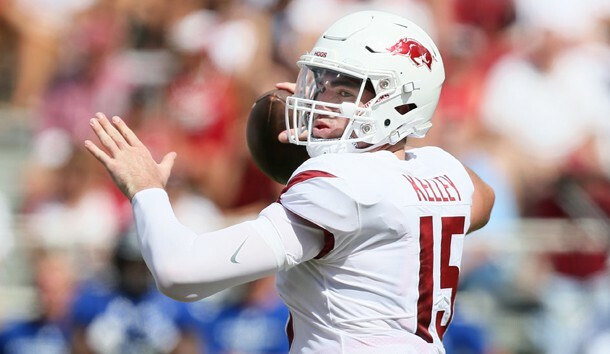 Arkansas’ debut under first-year head coach Chad Morris was a success, as the Razorbacks forced five turnovers and got a big performance off the bench from junior quarterback Ty Storey in a 55-20 home victory over Eastern Illinois. But Arkansas’ performance might have raised as many questions as it answered going into Saturday’s non-conference game against Colorado State. For starters, there’s the question of who will win Arkansas’ quarterback job. Storey sparked the Arkansas offense by completing 12 of 17 passes for 261 yards and three touchdowns and running for a fourth TD. Storey entered the game on the Razorbacks’ fourth offensive series, relieving sophomore Cole Kelley. “He went in, the game was still close, and provided a spark,” Morris said. Kelley completed 9 of 12 passes for 92 yards and a touchdown. While Morris said Storey would get most of the first-team reps in practice beginning Tuesday, he added that sophomore Cole Kelley will also play on Saturday. Another issue the Razorbacks hope to address before moving into Southeastern Conference play is their running game. Arkansas ran for just 80 yards on 37 attempts against Eastern Illinois — an average of less than 2.2 yards per rush. Those numbers are slightly skewed because Arkansas lost seven yards on kneel-downs on the final three plays of the game, but Morris acknowledged that the Razorbacks must run the ball better. Defensively, Arkansas dominated the game in the first half — forcing four turnovers as the Razorbacks shook off a slow start on offense for a 38-6 halftime lead. –LB Bumper Pool, a true freshman from Lucas, Texas, had a big game in his debut with the Razorbacks. Pool blocked an extra-point attempt and later returned a fumble 60 yards to the Eastern Illinois 5. He is expected to start for injured LB Dre Greenlaw (ankle). Greenlaw made 10 tackles, including seven unassisted, in the first quarter against Eastern Illinois before leaving with the injury. –WR Jordan Jones had his most productive game as a Razorback, catching five passes for 132 yards, including a 57-yard touchdown. A sophomore, Jones had his second consecutive 100-yard receiving game. He caught two passes for 122 yards in the 2017 season finale against Missouri. –LB De’Jon Harris led the Razorbacks last week with 11 tackles, including seven unassisted. Harris also broke up a pass and forced a fumble. –DB Ryder Lucas, a senior, and WR Mike Woods, a freshman, will be available to play this week, according to coach Chad Morris. Both were suspended from last week’s game after being arrested over the summer for suspicion of driving under the influence and careless driving.